Our assertion: Were he alive today and desperately needed cash, famed daredevil Karl Wallenda would find Zeek’s tightropes too dangerous to walk. Purported MLM “expert” sent to woodshed: Zeek “consultant” and former SEC defendant Keith Laggos reportedly gets the Zeek boot after using phrases associated with the investment trade and after suggesting that gambling regulations could be used to derail the Zeek train in the near future. Train wrecks and pom-poms: To his credit, MLMHelpDesk Blogger Troy Dooly reports the Laggos news and dubs an incendiary audio recording featuring Laggos into a Dooly-produced video. But known for his ability to find something “positive” in an MLM train wreck, Dooly goes on to suggest Laggos used Zeek-banned words because he was distracted and wasn’t concentrating. Dooly later declares that an examination into Zeek’s business practices by North Carolina Attorney General Roy Cooper is “exciting” news. Only in Stepfordian MLM: Zeek cheerleading video with Dooly presented as centerpiece and Laggos presented as key answer man remains online, even after Zeek cans Laggos and Dooly questions the ethics of Laggos while at once making excuses for him. Cluelessness: No guidance from Zeek on whether affiliates should avoid using the video when introducing Zeek. 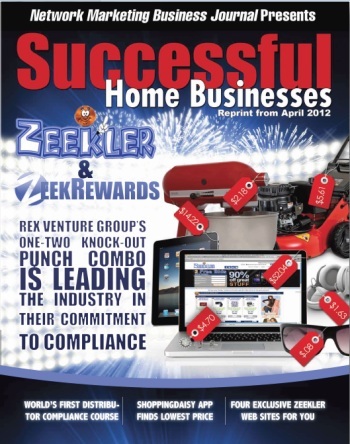 More cluelessness: No guidance from Zeek on whether affiliates should continue to use marketing props published by Laggos’ Network Marketing Business Journal, a previous subject of gushing from Dooly. Plan B: Laggos heralds Lyoness. Stepfordian MLM vomit: Lyoness trades on name of former South Africa President Nelson Mandela, a recipient of the Nobel Peace Prize. Why lots of people are fed up with Stepfordian MLM: As Lyoness uses an image of Mandela in a marketing campaign, AdSurfDaily’s Andy Bowdoin awaits sentencing in case in which ASD was accused of trading on the name of then-U.S. President George W. Bush to sanitize $110 million Ponzi scheme. Whatever “works” is OK in Stepfordian MLM: As nascent penny-auction site and upstart Zeek competitor known as Bids That Give prepped for launch and positioned itself as a company that would aid charities for children, early promos traded on the name of the White House and Chelsea Clinton, the daughter of former President Bill Clinton and U.S. Secretary of State Hillary Clinton. Oddities: Narc That Car/Data Network Affiliates/Phil Piccolo/Text Cash Network. EDITOR’S NOTE: While performing a high-wire stunt in Puerto Rico in 1978, legendary daredevil Karl Wallenda fell to his death. He was 73, a risk-taker to the end. This is one of those “only in Stepfordian MLM” stories, a story that features not one, but two tightropes over a treacherously windy gorge Karl Wallenda would judge too dangerous to walk even if the daredevil business were in a sustained slump and he desperately needed cash. These are the tightropes over the Zeekler/Zeek Rewards Gorge, a man-made gulch in Lexington, N.C., potentially MLM’s next Quincy, Fla.
Quincy was the home of AdSurfDaily, a company that did an almost inconceivable amount of damage to MLM’s already-suffering reputation — first by creating an obvious, five-alarm Ponzi scheme and trying to disguise it as a “revenue-sharing” program and, later, by trying to “save” itself by comparing the U.S. Secret Service to “Satan” and the 9/11 terrorists. Like the ASD story (and far too many MLM tales), the Zeek story is one that mixes the incongruous with the bizarre and only reinforces negative stereotypes about multilevel marketing. Laggos, though, appears not to have been fired for his ASD opinion. Indeed, Zeek may find comfort in that musing, which has been used by at least two ASD members (Todd Disner and Dwight Owen Schweitzer) who accused the U.S. government of presenting a “tissue of lies” to a federal judge when bringing the ASD Ponzi forfeiture case. Both of those ASD members also emerged as Zeek promoters. Curiously, the claim that the government had presented a “tissue of lies” was made long after ASD had lost the case in both U.S. District Court and the U.S. Court of Appeals. ASD and its apologists never were known for their impeccable timing. Neither was a 1-percent-a-day ASD knockoff known as AdViewGlobal (AVG), which incongruously announced a month after its February 2009 launch that its bank account had been “suspended” and that its CEO had resigned but would remain in the “accounting” department. Two months later, AVG, which purported to operate from Uruguay while using U.S.-based Gmail to perform customer service, announced its banking problem had been solved by an offshore facilitator. AVG made this announcement on the same day the President of the United States announced a crackdown on offshore fraud. AVG was done weeks later. Before it exited the stage, it apparently thought it prudent to threaten to sue members who shared negative information and perhaps even have their Internet connections shut down. Zeek is playing in this same bizarre field. Over the past couple of weeks, Dooly has ventured that Zeek might sue Randy Schroeder, an executive with the Mona Vie MLM company, for using words Zeek might find objectionable — “Ponzi” and “pyramid,” for example. And Dooly has suggested that a North Carolina credit union was risking a lawsuit from Zeek. Meanwhile, a Zeek critic known as “K. Chang” was informed by a purported Zeek “consultant” that Zeek might sue if its efforts to bring down “K. Chang’s’ site on HubPages.com failed. Zeek now bizarrely claims that “all” criticism of Zeek has been unfair. This claim was made just days after Zeek appears to have fired Laggos for casting his MLM line elsewhere while a Zeek “consultant” and while not sticking to the company line that Zeek does not constitute an investment opportunity. The other “program” is known as Lyoness, which Laggos has described as his “Plan B” and a “Plan B” for current Zeek members. To hear Laggos tell it on tape, the MLM business is the “momentum” business. One of the ways to maintain the momentum is to move certain banking operations offshore, say, to places such as Hong Kong. Laggos helped Zeek do that, according to Laggos. But Zeek might lose the mo and might not be far enough away to neutralize the regulators, he speculated. No matter, Laggos ventured. There’s always another company with mo. In HYIP-speak, the word “passively” is code that tells participants that they won’t have to do much or anything at all to pile up cash (a/k/a “passive earnings”) by the boatload if they send in enough cash at the beginning of a scheme. Zeek is afraid of that word because it’s the type of word that can cause the SEC to come knocking. Lots of MLM scams that rely on willfully blind promoters to gain a head of steam use it in the early stages. When things get too hot, they try to take it off the table. The reason they try to take it off the table — sometimes by threatening affiliates — is it can lead to civil and criminal charges, seizures of bank accounts and investigations by multiple agencies. Mixing the language of investments with references to Plan B didn’t do Zeek any favors, to be sure. Another thing that didn’t do Zeek any favors was Laggos’ reference to Zeek becoming the “momentum” company “last November.” In late September of 2011, the U.S. government released about $55 million in remissions payments to victims of the ASD Ponzi scheme. This leads to questions such as these: How much of Zeek’s “momentum” was fueled by funds originally seized in the ASD Ponzi case and returned to victims in the form of remissions payments? How many ASD members turned around and plowed what effectively was their crime-victim compensation into Zeek, another 1-percent-a-day scheme? Why did Zeek promoters and former ASD members Disner and Schweitzer wait until November 2011 — the same month Laggos now says Zeek became the “momentum” company — to file their ASD-related lawsuit against the government and to present a federal judge an opinion from Laggos that ASD was not a Ponzi scheme? “Plan B,” also known as “Don’t put all your eggs in one basket,” has a long and sordid history in HYIP Ponzi Land. AVG, for instance, was a de facto Plan B company set up after ASD, the Plan A company, got raided by the U.S. Secret Service on the Tuesday after the previous Friday’s seizure (Aug. 1, 2008) of ASD bank accounts. Lots of ASD members deluded themselves into believing that official company line that God was on ASD’s side. Some of ASD’s earliest post-seizure apologists told the troops that the seizure was a good thing because it would provide the government an opportunity to see how lawful and wholesome ASD truly was, that the government did not understand the business model and had made a monumental mistake. The MLM vultures, though, had a slightly different take. In case the government didn’t see the ASD light, they speculated, ASD members could join other autosurfs, HYIPs and cash-gifting schemes. These Plan B schemes would enable ASD losses to be made up elsewhere. “Offshore” programs were positioned as the best. The threat to Zeek, according to Laggos, is the FTC and how U.S. gambling regulations could be applied to penny-auctions such as its Zeekler arm. His words on the tape suggest he is confident that Zeek has sufficient cover to ward off a Ponzi/securities investigation. But even as he’s suggesting Zeek has the securities angle covered, he’s using the language of investments. We wonder: Can MLM really have sunk to these deplorable depths? Laggos then suggested Lyoness could be used as a hedge in case the FTC acted against Zeek. Dooly, whom to date hasn’t found Zeek’s various claims altogether too much, now has decided that Laggos crossed the altogether-too-much line when he harrumphed for Lyoness and used certain words Zeek finds offensive. While the featured speaker on the Lyoness call last month with Zeek members listening in, Laggos spoke about Zeek in “several” ways that were “way out of compliance,” Dooly ventured in his video report running on YouTube. In short, according to Dooly, Laggos’ big sin was painting Zeek as an investment program in contravention of the Rules Of Zeek. Not sticking to the script, however, is hardly an original sin within the Zeek sphere. In 2011, while speaking during a conference call to raise money for the Disner/Schweitzer ASD-related lawsuit against the government, Schweitzer, a one-time lawyer whose license was suspended in Connecticut, said he’d invested in ASD. Nevertheless, Disner and Schweitzer later presented a federal judge Laggos’ opinion that ASD was not a Ponzi scheme and that providing money to ASD did not constitute making an investment. Lyoness is an MLM company eager to let its participants and prospects know that it is building a school in the hometown of Nelson Mandela and that a Lyoness team recently was invited to the 1993 Nobel Peace Prize-winner’s home. It even publishes a picture to prove it and notes that a Mandela grandson is a Lyoness rep.
Back in the United States, meanwhile, former ASD President Andy Bowdoin will find out Aug. 29 how long he’ll spend in federal prison. Zeek’s business model and disclaimer language strongly resemble that of ASD, which the U.S. Secret Service described as a “criminal enterprise” that relied on linguistic sleight-of-hand to draft tens of thousands of people into an electronic Ponzi scheme. ASD traded on the name of then-U.S. President George W. Bush, in effect using the White House to sanitize a massive international fraud caper. Welcome to the Highwire Wing of MLM. While all of this is going on, a nascent penny-auction “program” and upstart Zeek competitor that claims it exists to elevate children out of poverty is getting ready to unleash itself on the consuming public. That “program” is known as Bids That Give. One prelaunch promo claimed that a founding affiliate was an SEO expert once hired by a candidate for the U.S. Presidency. The first three minutes of the promo did not even reference Bids That Give. Instead, it dropped names linked to the White House, including the name of former First Daughter Chelsea Clinton and Doug Read, an adviser to two U.S. Presidents. For good measure, the promo dropped the name of NBC News anchor Lester Holt. 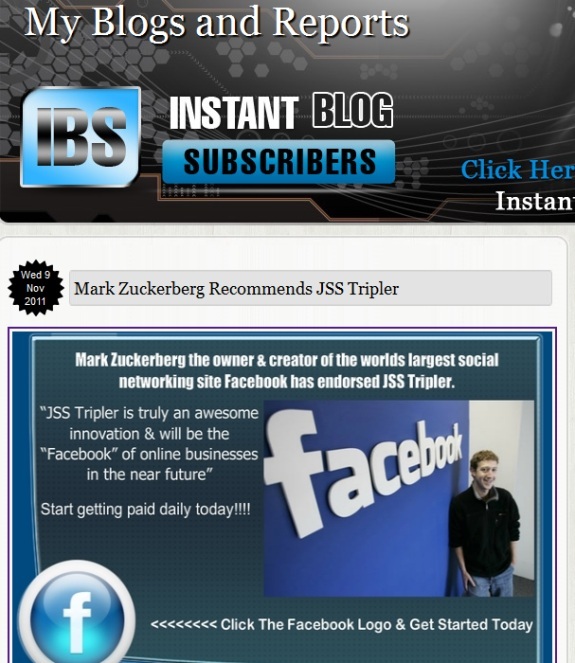 Did Mark Zuckerberg REALLY endorse JSS Tripler/JustBeenPaid. According to this Blog, the answer is yes. Facebook did not respond to a request for comment from the PP Blog last year on claims that Zuckerberg had endorsed JSS/JPB, which purports to provide a return of 60 percent a month. In 2009, ASD’s Bowdoin was sued by some members of his own company under the federal racketeteering (RICO) statute. Looking at it another way, the ASD members came to believe that ASD was a criminal enterprise with a plan to expand while coming up with new and better ways to steal. Because veteran MLM huckster Bowdoin also was a veteran securities swindler who’d been charged at the state level with fraud in at least three Alabama counties before launching Florida-based ASD in 2006, federal prosecutors said, Bowdoin tried to avoid the use of the language of investments as a means of keeping the 1-percent-a-day ASD scheme under the radar. Bowdoin tried to create additional cover by saying payouts were not guaranteed, according to federal court filings. Now, four years after the ASD raid, Zeek is using the same type of disclaimer language and members are getting the same sort of instructions on what words to avoid. “The [undercover agent] asked her about investing with ASD. She immediately said, ‘Don’t call it investing, you know what I mean, we can get in trouble if we say that, we have to be careful.” — Source: Federal forfeiture complaint, Aug. 5, 2008. To be sure, the departure from Zeek of Laggos is a big story. But it’s not the biggest story. The biggest story is that the Paul Burks-led company already was walking a tightrope when it hired the tightrope-walking Laggos and now has cut his rope, casting him into the gorge without informing the membership at large and without pulling the tightrope-walking promotional material that references Laggos or was produced by his publishing company. Some of that promo material features tightrope-walking Dooly, who’s now questioning the ethics of tightrope-walking Laggos. How strange is the latest PR disaster to rock Zeekland? So strange it almost defies description. As noted above, news of the Laggos departure was delivered by Zeek-friendly Blogger Dooly. And the news was delivered even as images of Dooly appeared online as a centerpiece in the same cheerleading video that features images of Laggos as centerpieces. The video largely consists of still photos taken at a Zeek “Red Carpet Day” event in Clemmons, N.C., on June 13. Incredibly, the video continues to appear online, despite the sudden and unexpected departure of Laggos last month. On Aug. 4, Zeek used its Blog to accuse unspecified “North Carolina Credit Unions” of slander for expressing concerns to customers about Zeek. The post implied Zeek members who didn’t toe the company line would be penalized. Such members were “violators” of company policy, the firm said. But Zeek has not addresed the Laggos issue on its Blog. Nor has it provided any guidance on whether members should stop using the Zeek cheerleading video that features both Laggos and Dooly, along with Zeek staffers, executives and members who showed up at the June 13 event in Clemmons. The Laggos-produced written materials also are out there, with no guidance from Zeek about whether members should continue to use them or to rely on them in any way. Zeek is making MLM look ridiculous. Troy Dooly is making it look sillier yet. He should not be “covering” a company that is trading off his credibility as an MLM advocate to sell itself. Dooly now is questioning the ethics of Laggos even as Dooly permits Zeek to use his image in marketing promos that also feature images of Laggos. Prior to opining that ASD was not a Ponzi scheme — only to be one-upped later by Bowdoin, who said that it was when entering a guilty plea to wire fraud in May 2012 — Laggos agreed to settle a 2004 case with the SEC that alleged he issued laudatory press releases and a laudatory article for a company that later become the subject of a securities investigation without disclosing he was being compensated for touting the purported opportunity. Laggos neither admitted nor denied the SEC’s allegations, which involved a company known as Converge Global Inc. and a subsidiary known as TeleWrx Inc. The future Zeek consultant settled the SEC case by disgorging nearly $12,000, paying interest of nearly $2,000, paying a civil fine of $19,500 and agreeing to a five-year penny-stock ban. “He is breaking a story here that I thought was amazing,” Dooly said of the NMBJ Zeek article, which gushed that Zeek has a 25 to 1 customer to rep ratio. The claim is important because, if true, it could take Ponzi and pyramid concerns out of play. Some Zeek critics doubt that it’s true. In April, Dooly noted that NMBJ was one of his favorite publications and that he picked it up on that particular Sunday while relaxing near his pool over a cup of tea. But now — less than four months after Dooly’s April 15 gushing story and video on NMBJ’s gushing story about Zeek and less than two months after images of both Dooly and Laggos appeared in the Zeek video in which Zeek gushed about itself — Laggos is out at Zeek. “Breaking MLM News: Zeek Rewards Officially Parts Ways With Dr Keith Laggos After Recorded Call Goes Public,” Dooly advised readers in a headline. The precise reasons for the departure of Laggos remain unclear. Also unclear is whether Laggos will retain a reported Zeek downline of about 4,500 members that he apparently was managing while at once being a paid Zeek consultant. Produced by USHBB Inc., which once produced videos for the bizarre (and failed) Narc That Car license-plate recording scheme that claimed some affiliates were out-earning the President of the United States, the Zeek video heralding Laggos, Dooly and others shows Dooly mugging with Zeek executive Dawn Wright-Olivares and Laggos posing with Peter Mingils. The last names of both Laggos and Mingils are misspelled in the USHBB video. Like Dooly, Mingils is a board member of the Association of Network Marketing Professionals. He’s also Zeek’s Training & Incentives Coordinator and is “rockin’ the Certified Trainers course curriculum,” according to Zeek. Affiliates of both Narc and Zeek, meanwhile, have sought to turn attention away from the core issues surrounding both Narc and Zeek by suggesting that the BBB is a fraud. But perhaps most compellingly, the now-failed Narc scheme once did at least part of its banking at NewBridge Bank, one of the banks that Zeek used before mysteriously announcing on Memorial Day that it was ending its relationship with NewBridge. Narc was based in Texas. How it ended up banking at NewBridge is unclear. What is clear is that Narc was a pyramid scheme that planted the seed it existed to help the U.S. AMBER Alert system for locating abducted children and traded on imagery of the White House. Both the U.S. Department of Justice and the National Center For Missing and Exploited Children, which administers part of the AMBER Alert program, confirmed to the PP Blog more than two years ago that they had no affiliation with Narc. Narc appears to have inspired a knockoff MLM scheme known as Data Network Affiliates, which was linked to longtime MLM huckster Phil Piccolo. In late 2011, DNA’s website — and the website of another a Piccolo-linked “program” known as OWOW — were used to drive traffic to an emerging MLM scheme known as TextCashNetwork (TCN). In December 2011, the PP Blog reported that TCN had used the name of Rex Venture Group on its website in the context of a purported “ASSIGNMENT” clause. The Rex Venture reference later mysteriously went missing from the TCN site, a circumstance that could cause investigators to question Rex Venture about whether it was aware that its name appeared on the TCN site and whether it had any business relationship with TCN. If this is modern MLM, MLM is in a lot of trouble. Karl Wallenda, who built a magical name in the daredevil business and made a career out of taking risks, wouldn’t do Zeek. Tags: AdSurfDaily, AdViewGlobal, Andy Bowdoin, ASD, AVG, Bids That Give, Converge Global Inc., Data Network Affiliates, Dawn Wright-Olivares, Dwight Owen Schweitzer, Keith Laggos, Lyoness, Mingils, MLMHelpDesk, Narc That Car, Network Marketing Business Journal, OWOW, Paul Burks, Phil Piccolo, Rex Venture Group, SEC, TCN, TeleWrx Inc, Text Cash Network, TextCashNetwork, Todd Disner, Troy Dooly, USHBB Inc.
Good article. Seems that the new era of Ponzie Scheme practice is that of inventing your own currency….whether it’s penny auction bids, points, gift cards, rebates. Seems like the government agencies our catching on pretty fast.